What does David J. Hand and an act of God have in common? 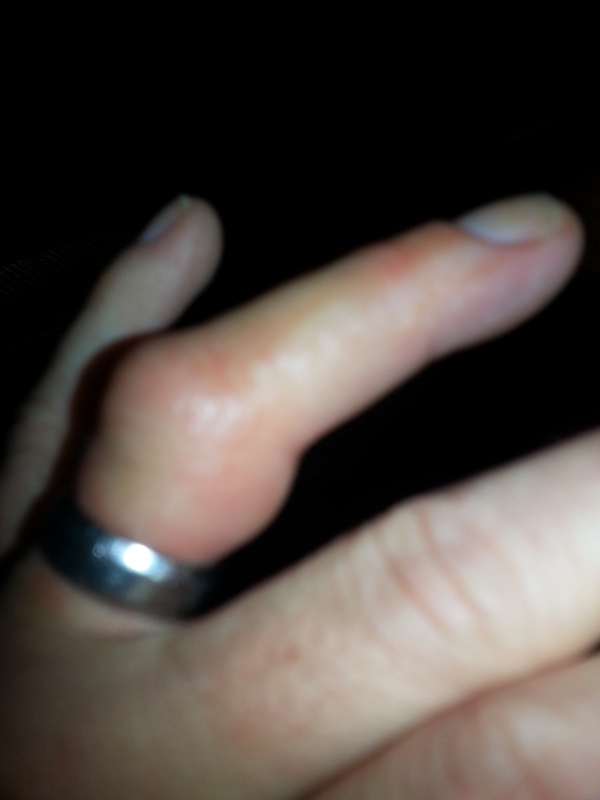 This past weekend while mowing the lawn I was stung on a finger. Not just any finger, but the only one of my ten digits that has a ring affixed to it. And not just any bee. This was a carpenter bee, one of those “non-social,” territorial bees that seem aggressive but come to find out rarely sting. They rather prefer to bore holes in the eaves of your home–and only the nesting females are even capable of stinging. My finger swelled up before I thought to remove the ring, and I suffered throughout the rest of the weekend wondering which would be cut off first, my stainless steel wedding ring, or my ring finger. I panicked. And all of this took place while reading David J. Hand’s The Improbability Principle: Why Coincidences, Miracles, and Rare Events Happen Every Day. So what were the chances that both the “Law of Truly Large Numbers” and the “Law of Inevitability” would play into my getting stung by a bee (that first got stuck in my hair), on my ring finger, while reading a book about how rare events happen every day, by an author with the last name of Hand? Well, Hand argues that extraordinarily rare events are commonplace. Not only that, we should all expect to experience a miracle roughly once every month. Someone, somewhere, at some time won a lottery twice, and Hand provides several examples. He also provides a fascinating analysis of a man whom I have written about in “Seven Lightning Strikes,” of Roy C. Sullivan, the man who was struck and survived seven times (only to commit suicide). Through the statistical revelations of the “Law of Truly Large Numbers” though, this is not quite as amazing as it first appears. Sullivan was a park ranger in Virginia, and no doubt spent a great deal of time outside in all kinds of weather. He was struck in 1942, 1969, 1970, 1972, 1973, 1976 and 1977, and also, he claimed, once as a child. Basically, probabilities and chance are counterintuitive. We tend to underestimate high probabilities and overestimate low ones. The birthday problem is a simple example. What is the lowest number of people who must be in the same room to make it likelier than not that at least two of them have the same birthday (day and month, not year)? The answer is a surprisingly small 23. Use it as an icebreaker in classrooms or wherever roughly 30 or more are gathered. If there are 30, the probability of a shared birthday is about 0.7 (or 70 percent). It reminds you of Bill Bryson’s #1 most amazing thing he knows, and Alan Lightman’s highlighting the problems and possibilities of a multiuniverse. How to combine the various strands or “Laws”? Read the final chapter “How to Use the Improbability Principle,” and find out. The two things I discovered? (1) If you want a ring that almost no one can cut off even if your very finger depends on it go with stainless steel. (2) There’s nothing like a steroid shot to produce the miracle of healing.